Payment Mode- DD in Favour of "AIRLINE ALLIED SERVICES LIMITED" Payable at 'New Delhi'. Passed Intermediate Exam from any Recognized Board(Preference will be given to Candidate Having Degree/Diploma in Hotel Management). 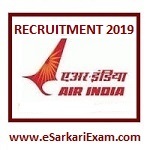 Eligible Candidates can Submit AASL Cabin Crew 2019 Online Application at the Official Website of Air India Limited Latest by 19th April 2019. Applicants First Open Air India Limited Official Website. Click on Cabin Crew Advertisement in Alliance Air Link. Now Click on Apply Online for Cabin Crew Link. Open Apply Online for Trainee Cabin Crew Link. Read Instructions Carefully and Click on Apply Online Link.